Being pregnant on Halloween is a blessing in its own right because it's the only time maternity Halloween costumes can be creatively worn. Halloween gives a pregnant woman the perfect excuse to dress as a pregnant nun, a pregnant prom queen, or the pregnant wife of Frankenstein. It's also a day to dress a large belly as a pumpkin, a watermelon, or a beach ball by decorating it with non-toxic paint.Attempting to find a great costume for Halloween is a hard job for most people, and it's even harder for someone who is eight or nine months pregnant. When pregnant, it may seem like the choices for maternity Halloween costumes are rather limited. However, the opposite is actually true. Picking a great costume for a pregnant woman just takes a little bit of creativity. For anyone who feels comfortable pulling up her shirt and letting her belly be the focal point of the Halloween costume, there are many great ideas that involve decorating the mid-section. There are types of non-toxic paint that can be used to decorate a woman's protruding stomach that pose no danger to the unborn baby. One fun idea is to coordinate a belly costume with the costume your partner will wear. For example, the belly can be painted as a basketball, and your partner can dress as a professional basketball player. Or, the belly can be painted as a fishbowl with fish swimming in it, with an accompanying fisherman. If painting a big belly sounds like fun but the pregnant woman doesn't want to pull up her shirt, a shirt with a big hole cut in the front can be used. That way, the belly can poke through and the momto-be does not have to feel like she's exposing too much skin. One of the funniest types of costumes for a pregnant woman is a regular costume that has been made pregnant. These types of maternity Halloween costumes can be truly entertaining! 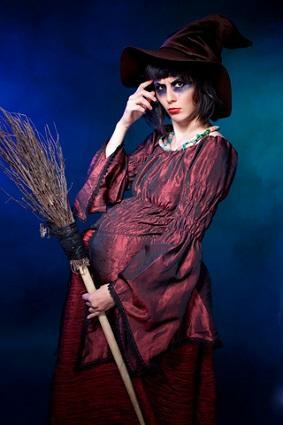 By all means, any pregnant woman should use her big belly to her advantage on Halloween. Dressing in a cute and creative costume that either obviously displays or completely covers a pregnancy is sure to bring lots of attention from others. A woman with an unusual and funny costume that focuses on her pregnant belly is sure to hear comments such as, "That's such a clever costume!" A woman who is wearing a Halloween costume that completely hides her nine-month pregnant stomach will receive comments like, "You don't even look pregnant!" No matter what, a pregnancy should not keep a woman home on Halloween. Dress the belly (or hide it), and attend a party… or go Trick or Treating and tell the people who answer the door that the candy is for the baby!